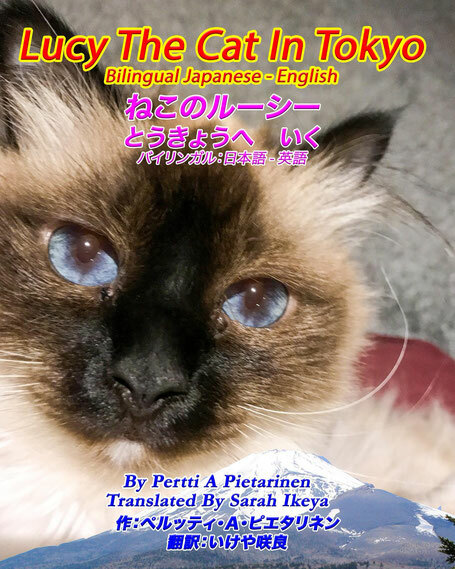 Lucy The Cat in Tokyo is the eight volume in Lucy The Cat series. Lucy The Cat has always dreamed about visiting Japan. One day she decides to make her dream come true and she travels to the Land Of The Rising Sun. There are so many interesting things to see and to do in Tokyo. Tokyo has many high-rise buildings and sightseeing towers like Tokyo Tower and Tokyo Skytree, providing exciting views over the big busy city. Lucy wants to have also fun and in Tokyo Disneyland she meets Mickey Mouse and Minnie. After busy days Lucy wants to relax and feel the Japanese harmony in charming Japanese gardens. Mount Fuji makes a real impression, but maybe the most exciting experience for a cat is to visit the Cat Shrine and to meet other cats in cat cafés.